Sit. Stay. Carry a Basket of Flowers. 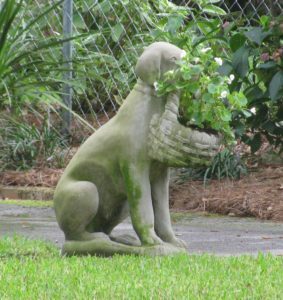 Last week, I talked about how obedient the dog statues are in our neighborhood. They never move. Not even to chase a squirrel. But this statue gives me pause. All the other dog statues hold stone baskets that are filled with stone flowers. He holds fresh flowers that are rotated seasonally. Does he fetch them himself?